A couple of weeks ago I was a victim to the impulse buy at the store. I was at the grocery store. Of all places! And they had peregrine falcons. 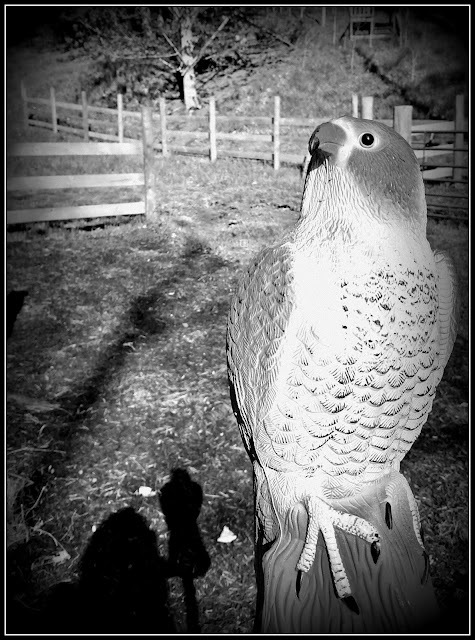 Of course my garden needed a falcon. My grocery list most certainly did not contain the phrase "peregrine falcon" in between the tortillas and the almond milk. As tempting as it was to buckle him into the passenger seat and call him Fred on the way home, I bagged him and stuck him in the trunk instead. Just as well, because he might've tried to control the radio. Now he has a prominent spot in the garden where his job is to scare away rabbits and groundhogs. I'm not sure how good Fred is at his job. I hope he's on his game. Readers, have you had any impulse buys at the grocery store lately? Fred has a tough job. I know my rabbits are way too dumb to notice what the heck is going on. My impulse buys are in the ice creme isle. I hope that he doesn't fly away! I like the falcon. I bought three fifty caliber ammo cans on our last grocery shopping trip. You sure tricked me Lisa. I was wondering what kind of a grocery store you were shopping at! I hope your Falcon does his job well for you. Oh, I have a blue heron to keep away the herons from my pond. But, now I see that I need something to scare away the darn ducks. I have two poopy ducks coming each day and Owen and Hobbes are not doing their job to keep them at bay. So, what is the falcon's name? hahaha I had to read it twice. Good old Fred! Once when my ex-wife, who was a complete animal lover, pissed me off I bought 20 duckling chicks and had them delivered to her office as a gift. It took a while to realise that it was not a real bird, but it is late and I am tired and that is my excuse for being slow on the uptake! I love this story! We have an owl that does the same job! Be sure to move him around your garden daily so they think he is real. Hope he works. I think it was smart purchase for your garden! That's Mica's favorite animal. It is pretty. I hope it helped keep the pests away. There is always something that ends up in the basket. However, not as interesting as Fred! Our grocery store does not carry birds of prey. Fred looks super cool. I bet he's doing a great job, Lisa..